Four families, in four different cities, over four centuries, make the same delicious dessert: blackberry fool. This is a beautiful book. 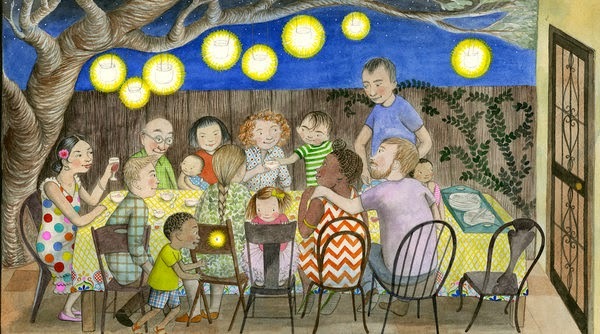 In concept, language, illustrations and artifact, there is so much to love. then mixed it with the cream. "You may lick the spoon, child,"
First, it's about a dessert—a positively scrumptious-sounding dessert, and Jenkins' delicately descriptive prose makes you want to taste the berries and lick sweet cream off the spoon. 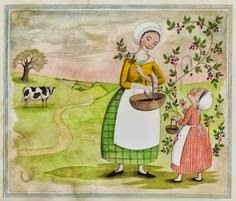 Children will pore over Blackall's deliciously detailed illustrations with equal delight. 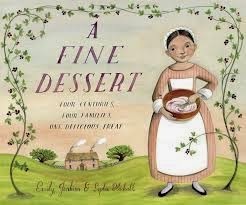 In addition to being a satisfying read aloud, it's a subtle history lesson, folded gently into the changes of costume, landscape, and recipe techniques through the ages. But one thing remains constant: blackberry fool is a dessert to be savored and enjoyed. And the same goes for this fine gem of a picture book. I adore the endpapers, as well as the notes from Emily and Sophie about their research process! Glorious book indeed. Yes! Every inch and detail of this book is delicious! Thanks for reading and commenting, Cathy!